Benito Mussolini is known for having been a horrible warmongering fascist dictator. However, he was also responsible for a major failed monetary experiment – the so-called Battle of the Lira. Hence, in 1926 Mussolini announced a major revaluation of the Italian Lira as part of his general plan to revive the greatness of Italy. “It is just one year since Premier Mussolini, speaking at Pesaro, delivered that oration, destined to remain famous in the annals of modern Italian history, in which he announced his intention to revalue the lira. ‘We shall never inflict upon our wonderful Italian people, which for four years has been working with ascetic discipline and is ready for even greater sacrifieces, the moral shame and economic catastrophe of failure of the lira,’ he declared. “But the result has not been obtained without servere…jolts affecting all classes of citizens. …Revaluation has led to a period of general stagnation and lack of enterprise in industry, for the gold value of money has increased automatically while the revaluation process was in progress and people preferred to leave their money in banks to rising it in ventures of any kind. That of course never happened. Instead the Italian economy was hit by yet another shock in 1929 when the global crisis hit. Finally in 1934 Mussolini decided to give up the gold standard and in October 1936 the lira was devalued by 41%. What role Mussolini’s failed monetary policy played in his domestic policies and particularly in the foreign policy “adventures” – his war against Abyssinia in 1935-36 and his decision to ally himself with Hitler and Nazi-Germany in WWII – I don’t know, but there is nothing like war to take away the attention from failed economic policies. Behind each new political move in Europe, which expresses itself in the mobilization of larger armies, may generally be found an economic cause. The foreign trade of Italy is, figuratively, “shot to pieces.” The decrees against imports , the unwillingness to do business except where equal valued are exchanged by a foreign nation and the high rate of the lira have produced an alarming situation for a country that today under unobstructed movements of goods, would have an unfavorable trade balance. It is too bad today’s European policy makers didn’t study any economic history. Italy was hit by strikes, violent demonstrations and protests against refugees on Friday as anger and frustration towards soaring unemployment and the enduring economic crisis exploded onto the streets. Riot police clashed with protesters, students and unionists in Milan and Padua, in the north of the country, while in Rome a group of demonstrators scaled the Colosseum to protest against the labour reforms proposed by the government of Matteo Renzi, the 39-year-old prime minister. Eggs and fire crackers were hurled at the economy ministry. On the gritty, long-neglected outskirts of Rome there was continuing tension outside a centre for refugees, which was repeatedly attacked by local residents during the week. Locals had hurled stones, flares and other missiles at the migrant centre, smashing windows, setting fire to dumpster rubbish bins and fighting running battles with riot police during several nights of violence. They demanded that the facility be closed down and claimed that the refugees from Africa and Asia were dirty, anti-social and violent. Some protesters, with suspected links to the extreme Right, yelled “Viva Il Duce” or Long Live Mussolini, calling the migrants “b*******”, “animals” and “filthy Arabs”. …A group of 36 teenage migrants had to be evacuated from the centre in Tor Sapienza, a working-class suburb, on Thursday night after the authorities said the area was no longer safe for them. The sense of chaos in the country was heightened by transport strikes, which disrupted buses, trams, trains and even flights at Rome’s Fiumicino airport. Demonstrations also took place in Turin, Naples and Genoa. Unemployment among young people in Italy is around 42 per cent, prompting tens of thousands to emigrate in search of better opportunities, with Britain the top destination. The overall jobless rate is 12 per cent. Mr Renzi’s attempts to reform the country’s labour laws, making it easier for firms to dismiss lazy or inefficient employees, are bitterly opposed by the unions. The ongoing recession has also exacerbated racial tensions, with some Italians blaming refugees and immigrants for their economic woes. It is hard not to be reminded of the kind of political and social chaos that we saw in Europe in the 1930s and it is hard not to think that the extremely weak Italian economy is the key catalyst for Italy’s political and social unrest. 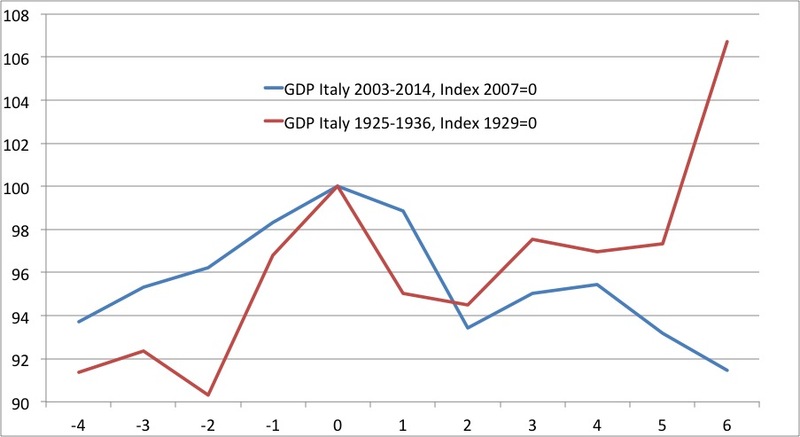 By many measures the Italian economy of today is worse than the Italian economy of the 1930s. One can say – as Brad DeLong has suggested – that this is a Greater Depression than the Great Depression. Just take a look at the development in real GDP over the past 10 years and during the 1925-1936-period. If you wonder why Italian GDP took a large jump in 1936 (year +6) it should be enough to be reminded that that was the year that the Italian lira was sharply devalued. Today Italy don’t have the lira and everybody knows who I blame for the deep crisis in the Italian economy. It is sad that so few European policy makers understand the monetary causes of this crisis and it is tragic that the longer the ECB takes to act the more political and social unrest we will face in Europe. PS I do not mean to suggest that Italy do not have structural problems. 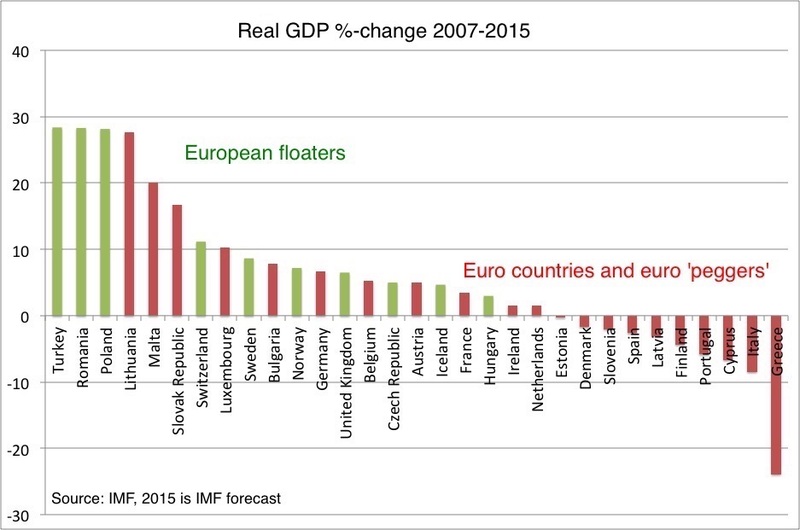 Italy has massive structural problems, but the core reason for the Greater Depression is monetary policy failure. Don’t blame Renzi or the immigrants – blame the Italian in Frankfurt. Yesterday we got confirmation that Italy feel back to recession in the second quarter of the year (see more here). In this post I will take a look at three terrible ‘gaps’ – the NGDP gap, the output gap and the price gap – which explains why the Italian economy is so deeply sick. Where M is the money supply, V is money-velocity, P is the price level and Y is real GDP. Where N is nominal GDP. From N, P and Y we can construct our gaps. 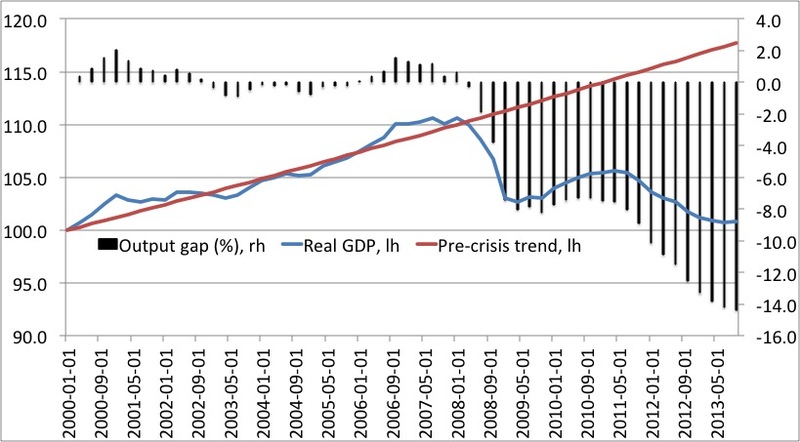 Each gap is the percentage difference between the actual level of the variable – for example nominal GDP – and the ‘pre-crisis trend’ (2000-2007). We start by having a look at nominal GDP. We can make numerous observations based on this graph. 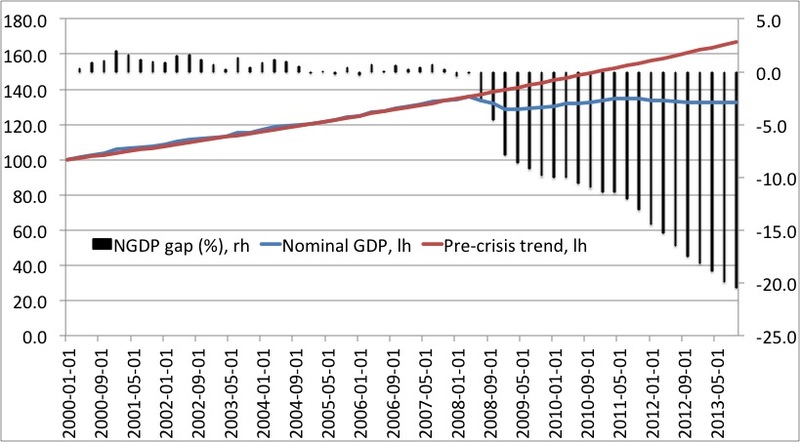 First of all, we can see the Italian euro membership provided considerable nominal stability from 2000 to 2008 – nominal GDP basically followed a straight line during this period and at no time from 2000 to 2008 was the NGDP gap more than +/- 2%. During the period 2000-2007 NGDP grew by an average of 3.8% y/y. Second, there were no signs of excessive NGDP growth in the years just prior to 2008. If anything NGDP growth was fairly slow during 2005-7. Therefore, it is hard to argue that what followed in 2008 and onwards in anyway can be explained as a bubble bursting. Third, even though Italy obviously has deep structural (supply side) problems there is no getting around that what we have seen is a very significant drop in nominal spending/aggregate demand in the Italian economy since 2008. This is a reflection of the significant tightening of Italian monetary conditions that we have seen since 2008. And this is the reason why the NGDP gap no is nearly -20%! Given this massive deflationary shock it is in my view actually somewhat of a miracle that the political situation in Italy is not a lot worse than it is! The scale of the deflationary shock is also visible if we look at the development in the price level – here the GDP deflation – and the price gap. The picture in terms of prices is very much the same as for NGDP. Prior to 2007/8 we had a considerable level of nominal stability. The actual price level (the GDP deflator) more or less grew at a steady pace close to the pre-crisis trend. GDP deflator-inflation averaged 2.5% from 2000 to 2008. 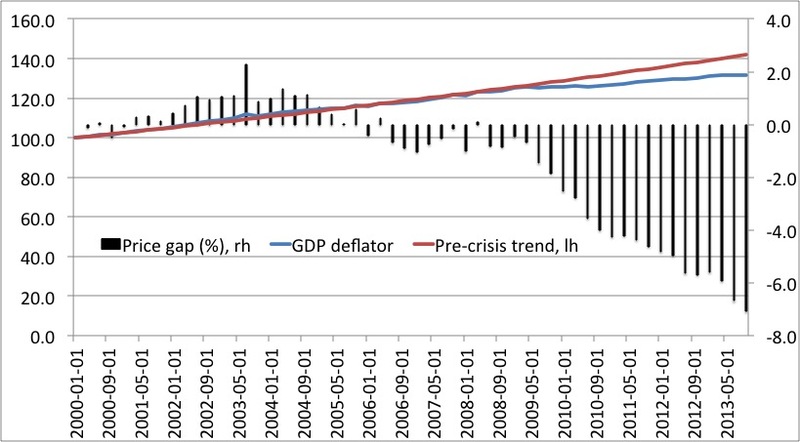 However, we also see that the massive deflationary trends in the Italian economy post-2008. Hence, the price gap has widened significantly and is now close to 7%. It is also notable that we basically have three sub-periods in terms of the development in the price gap. First, the ‘Lehman shock’ in 2008-9 where the price gap widened from zero to 4-5%. Then a period of stabilisation in 2010 (a similar pattern is visible in the NGDP gap) – and then another shock caused by the ECB’s two catastrophic interest rate hikes in 2011. Since 2011 the price gap has just continued to widen and there are absolutely no signs that the widening of the price gap is coming to an end. What should be noted, however, is that the price gap is considerably smaller than the NGDP gap (7% vs 20% in 2014). This is an indication of considerably downward rigidity in Italian prices. Hence, had there been full price flexibility the NGDP gap and the price gap would have been of a similar size. We can therefore conclude that the Italian Aggregate Supply (AS) curve is fairly flat (the short-run Phillips curve is not vertical). In a world of full price flexibility the AS curve is vertical and as a result a drop in nominal GDP should be translated fully into a drop in prices, while the output should be unaffected. 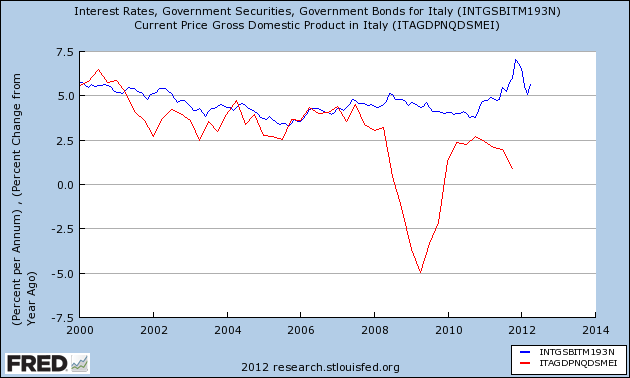 However, as the difference between the NGDP gap and the price indicates the Italian AS curve is far from vertical. Therefore we should expect a major negative demand shock to cause a drop in prices (relative to the pre-crisis trend), but also a a drop in output (real GDP). The graph below shows that certainly also has been the case. The graph confirms the story from the two first graphs – from 2000 to 2007 there was considerably nominal stability and that led to real stability as well. Hence, during that period real GDP growth consistently was fairly close to potential growth. However, the development in real GDP since 2008 has been catastrophic. Hence, real GDP today is basically at the same level today as 15 years ago! The extremely negative development in real GDP means that the output gap (based on this simple method) today is -14%! And worse – there don’t seems to be any sign of stabilisation (yesterday’s GDP numbers confirmed that). And it should further be noted that even before the crisis Italian RGDP growth was quite weak. Hence, in the period 2000-2007 real GDP grew by an average of only 1.2% y/y – strongly indicating that Italy not only has to struggle with a massive negative demand problem, but also with serious structural problems. The message from the graphs above is clear – the Italian economy is suffering from a massive demand short-fall due to overly tight monetary conditions (a collapse in nominal GDP). One can obviously imagine that the Italian output gap can be closed without monetary easing from the ECB. That would, however, necessitate a sharp drop in the Italian price level (basically 14% relative to the pre-crisis trend – the difference between the NGDP gap and the price gap). A back of an envelop calculation illustrates how long this process would take. Over the last couple of years the GDP deflator has grown by 1-1.5% y/y compared a pre-crisis trend-growth rate around 2.5%. This means that the yearly widening of the price gap at the present pace is 1-1.5%. Hence, at that pace it would take 9-14 years to increase the price gap to 20%. However, even if this was political and socially possible we should remember that such an “internal devaluation” would lead to a continued rise in both public and private debt ratios as it would means that nominal GDP growth would remain extremely low even if real GDP growth where to pick up a bit. Concluding, without a monetary easing from the ECB Italy is likely to remain in a debt-deflation spiral within things that follows from that – banking distress, public finances troubles and political and social distress. PS An Italian – Mario Draghi – told us today that the ECB does not think that there is a need for monetary easing right now. Looking at the “terrible gaps” it is pretty hard for me to agree with Mr. Draghi. Ten-year Spanish government bond yields rose on Monday as the country’s opposition party called for the resignation of Prime Minister Mariano Rajoy over a corruption scandal. Ten-year Italian government bond yields also rose on concerns that a scandal involving Monte Paschi bank could see a rise in the popularity of the centre-right party in the polls, whose election charge is being led by former prime minister Silvio Berlusconi. So where are we now? It to me all dependent on the ECB. If the ECB move towards a clearly rule based regime – in a similar fashion as the Fed and the BoE (and likely soon also the Bank of England) then we are likely to see markets becoming more immune to political jitters. On the other hand if the ECB moves back to the bad habit of conditioning monetary policy on political outcome then once again the markets will start worrying about the finer details of Italian and Spanish politics. PS Some would argue that European monetary conditions have become tighter recently as a result of higher money market rates and yields. However, I don’t think that is the case. Higher yields and rates reflect growth optimism – just look at European stock markets and implied inflation expectations in the European fixed income markets. Market Monetarists don’t run for the door in panic when yields rise – rather we argue that you should not make the interest rate fallacy and confuse higher (lower) rates/yields with tighter (easier) monetary policy. As Milton Friedman reminds us rates and yields are high (low) when monetary policy has been easy (tight). When the eurocrat Mario Monti became Prime Minister last year we were told that he was the man to turn around the Italian economy. We were told that technocrats would do the job rotten and incompetent politicians were not able to do. However, the eurocrat Papademos did not last long in Greece and now Mario Monti is beginning to sound rather desperate. On Thursday he told reporters that EU policy makers had one week to save the euro. That is somewhat of a stern warning from somebody who is supposed to be a cool-headed technocrat. Why this sudden desperation from Monti? Well, it is pretty simple – Italian nominal GDP is declining sharply, while Italian funding costs are increasing sharply day-by-day. With NGDP declining rapidly the public debt-to-GDP ratio obviously is exploding and as investors know that the ECB has not shown any willingness to curb the decline in NGDP then Italian debt as share of GDP is likely to continue to increase no matter how many budget cuts and tax increases the Italian parliament passes. It is very simply – without growth in NGDP the Italian government will fast become insolvent. Therefore, it is not really Angela Merkel Mario Monti should be asking for help to solve the crisis, but rather his namesake and countryman ECB chief Mario Draghi. The ECB can end this crisis by introducing a determined policy to curb the drop in euro zone NGDP (or rather to increase NGDP markedly). On the other hand if Draghi does not act then it might very well be that Monti is right about his warnings. PS Meanwhile Monti’s predecessor is having other ideas (remember Italy never defaults – Italy inflates…) and it is not the first time. Market attention has changed from Greece to Italy. As in Greece the centre of attention is the dual concerns of public finance trouble and political uncertainty. A look at Italian economic and monetary history, however, reveals some interesting facts. While Greece is a serial defaulter Italy has in fact only defaulted on it’s public debt one time since Italy become an independent and unified nation in 1861. Contrary to this Greece has been in default in more than 50% of the time since it became an independent nation in 1822 (1830). Minimal knowledge of Italian history will teach you that the country is notorious unstable politically and that public finance trouble historically as been as much a norm as in Greece so how come that the Italian government has not defaulted more than once? Some Unpleasant Monetarist Arithmetic will help us explain that. Sargent and Wallace teach us that public deficits can be financed by either issuing public debt or by printing money. Historically Italian governments have had a clear affinity for printing money. Rogoff’s and Reinhardt’s “This Time is Different” provides us with the statistics on this. Hence, among the present euro countries Italy has been the third most inflation-prone country historically – after Austria and Greece. Hence, since 1800 Italy has had inflation above 20% in more than 11% of the time. The similar numbers for Austria and Greece are 20% and 13% respectively. Michele Fratianni, Franco Spinelli and Anna J. Schwartz have written the “Monetary History of Italy” and the authors reach the same conclusion – that the core of Italy’s inflationary problems is the Italian government’s lack of ability to balance the budget. This time around the money printing option is not easily available – at least not if the Italian government wants to keep Italy in the euro zone. Sargent and Wallace would tell us to watch inflation expectations to see whether the Italian government is credible or not when it says it will not leave the euro.